MommaSaid | My Life on the B-Roll: My Left Hand on The Daily Show? Browse: Home / 2011 / April / 20 / My Life on the B-Roll: My Left Hand on The Daily Show? My Life on the B-Roll: My Left Hand on The Daily Show? Never mind that Libyans surely do not use a QWERTY keyboard, as my friend Gwen later pointed out. Somebody at ABC must have typed in “women” and “blogger” into their b-roll system and pulled out this old video of me typing. Perhaps my left hand represented mom bloggers worldwide. Granted, my fingers have since gotten thinner, but the rings match. I had to launch an investigation into what I would come to call, Hand-Gate. I had indeed appeared on ABC’s World News Now way back in the day (so far back, I can’t find it on the Internet), so ABC could have filmed my left hand. I watched the segment, which I have on DVD, but they never showed my hand typing. 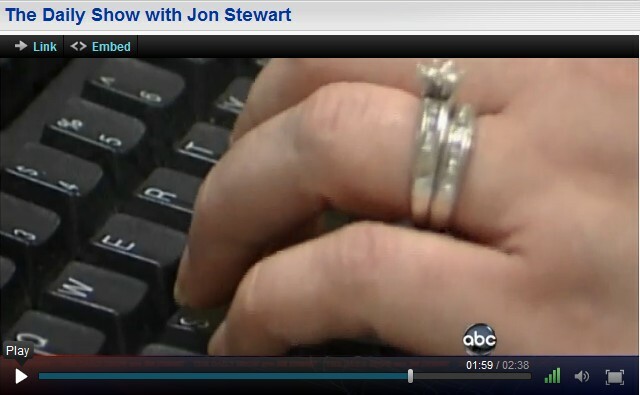 An investigation into old TV segments and my photos from 2005, when ABC had (possibly) filmed my left hand revealed that my keyboard wasn’t black, but white. I have since replaced it and the crumbs inside it. Also, the keyboard on the Daily Show wasn’t ergonomic, like mine have long been. That wasn’t my left hand, but an impostor! Not really, but I’ve only ever heard the word “impostor” on Scooby-Doo, and I’ve always wanted to use it in conversation. Alas, my hand, and in fact, no part of me, has ever appeared on “The Daily Show.” I haven’t even attended a taping of the show, though I came close last fall when my friend Jenna snagged tickets and invited me, but Back-to-School night prevented me from going. (I’d already missed one for a Springsteen concert, so…). Now to get back to blogging about the Libyan uprising. I'll Show You Tired, Kid. Dammit, I was all ready to stage a massive boycott of The Daily Show on your hand’s behalf…. Oh well, back to folding laundry. I can see that you are angling for a spot on “The Daily Show,” even if you haven’t been there yet. Because “The Daily Show” is the height of It-Ville. So I will hope that you do get a spot on “The Daily Show” and that they show more than just your left hand. Say Hi to Jon Stewart for me.